Want to share audio between applications easily on an Intel Mac? Now you can. 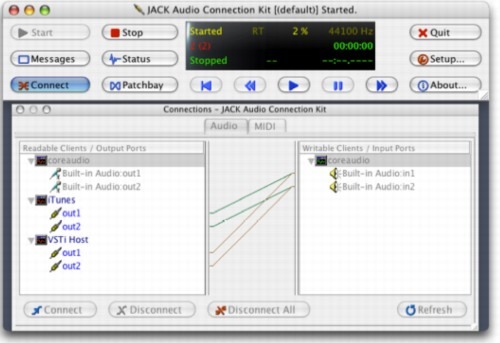 JACK OS X, the superb open-source solution for routing audio between applications and computers on Mac OS X, is now a Universal binary for Intel/PowerPC Macs with today’s release of version 0.73. That means if you’re running an Intel Mac, you can now easily route audio between your Intel-native copies of software like Ableton Live (released last week) and Apple Logic Pro (shipped last month). Congrats to the JACK OS X team for getting this out there so quickly!